The year was 1976. There I was, sitting in the back of pickup truck on a sunny Sunday, in the middle of beautiful downtown Bland. I was picking a banjo and drinking beer, (that's about all there was to do in beautiful downtown Bland) when my airplane flying buddy Seldon Stowers drove up and started yelling. He wasn't mad or anything, that's just the way Seldon talks. Folks around here call him Squawk, as anybody that attended my wedding knows what I'm talking about. He was trying to tell me about some guys jumping off the mountain on kites. "Yeah, right", I exclaimed, "hand me another Blue Ribbon", "No, really", he said,"and they're landing at Andrew Hounshell's in Wackertown." Wackertown is actually 3 or 4 houses at the end of a country road at the base of Big Walker Mnt. The residents of these houses are known as Wackers. Going to school is not high on a Wacker's list of things to do in life. Once, the Superintendent of Schools, who was forcing Andrew (the King Wacker) to send his kids to school, and a teacher, visited him to discuss his boys behavior in class. "I can't do anything with him", the teacher pleaded, " for example, just the other day I asked your Andy, Who wrote the Declaration of Independence and he", before the teacher could get in another word Andrew wheeled around, popped Andy on the head and said " Dammitt boy, if'n you wrote it, fess up!" Anyway, there I was with nothing else to do but go and check out Seldon's story. I arrived at Big Walker Lookout, a local tourist attraction on top of Big Walker Mnt. and sure enough, there they were. Huge Kites! The first attempt I witnessed was not impressive. The guys name was Dave Higgembothem. First, he had to time his run so he wouldn't become chair lift bait. Take off was near the turn around end of a chair lift, so the pilot had to start his run just after 2 chairs passed and run between them. Dave did pretty well in this event but as he reached maximum speed, he next had to clear 7 foot tall Rhododendron bushes that the owner had forbidden anyone to cut. The tourist loved them when they were in bloom, especially with a colorful glider laying on top of them. And that's just what he did, popped the nose up, stalled, and settled gently into the bushes. But this didn't seem to deter any of the group. In no time they had him out of there and in position, waiting for his next window of opportunity. The leaves rustled, the chairs passed, the feet pattered, the nose popped, and the glider flopped. Three times this happened. I was beginning to think that this was all there was to it, when on his fourth try he cleared the bushes and sailed away, slowly gliding to Wackertown, far below. It was the most beautiful event I had ever witnessed and from that moment on, my life would change forever. I volunteered to drive for them and soon I arrived in Wackertown to pick them up. The first thing I noticed was the excitement among the pilots. The flights were no more than a few minutes long, but you'd have thought they'd landed on the moon. The Wackers were coming out of their houses and joining in the camaraderie. "When you go'na jump Newberry? ", Andrew asked. "Soon as possible", I replied. Andrew started telling everybody tales, including stories of the Newberry history. " Hell, they're so damn tight, when they die the undertaker has to split the cheeks of their butts to get their eyes to shut!" Everybody got a big kick out of this and soon I was one of the group. 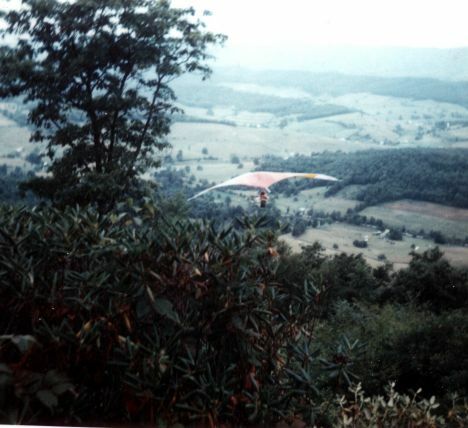 Rodney Pendry, who was flying with a cast on his wrist and two front teeth missing, (minor gliding accident) arrived at my house a few days later, with a training glider and we were soon on top of a local hill setting the thing up. He was explaining everything as he assembled this precarious looking, duct tape laden craft, and informed me that this particular model, The Sorcerer, was made by a Polish guy named Chuck in Cleveland. Second thoughts started to creep into my once made up mind. I said "Cleveland! How or why would a guy in the flat lands of Ohio design a glider? How would he fly it? How would he test it? How", "He reads a lot! Here. Put this on." Rodney exclaimed as he handed me the harness. This so called harness consisted of two straps that ran across your shoulders, down your chest, between your legs, (one on each side of the Family Jewels) and up the back to the starting point, where a carabiner was attached. As I put on this contraption, second thoughts were now in epidemic proportions, but this instructor, with no front teeth and a cast on his arm assured me, with a slight whistle, "It's a peeth of cake!" Standing there looking down the hill, hooked in and ready to go, dreams of my childhood entered my thoughts. I guess there aren't many kids who didn't at one time dream of going up on the house with an umbrella or wing of some description and sailing off into the skys like a bird. Well, there I was about to do it, and I knew I was going to die. "It gets dark at 7:30" Rodney jokingly remarked. "OK, OK, I'm going!" With all the knowledge my instructor could put in my head in his 10 minute ground school, I finally started to run. And run and run and run. "Push out!" he screamed "Push out!" , as he ran behind me. As I did this, I noticed that my feet were still running but were no longer touching the ground. As it dropped away my childhood dream re-entered my thoughts. "Pull in!! Pull in !!! ", Rodney yelled, disrupting my dream. I distinctly remembered him saying, Push out to go up and pull in to go down. Pull in? He must think I'm scared! I WAS FLYING!! Well, I thought I was. About that time things got real quiet except for Rodney screaming, and the ground was coming at me at a high rate of speed. I prepared for a belly landing like on TV when you see the planes do a gear up landing, skidding easily across the ground for hundreds of yards. That didn't happen in this case however. When the control frame made contact it stopped, but I continued on, smacking the ground then swinging forward and crashing into the keel of the glider. As I lay there wondering if I would ever walk again, much less fly, it came to me how my childhood dream usually ended. JUST LIKE THIS!! "You OK? ", Rodney asked, "Man, that was great!" "It was? ", I replied. "Yeah. Most people usually don't get off the ground before they crash." he said as he unhooked me. "Rod, I know this is a dumb question, but do they make wheels for these things?" He answered, "Hey, you might have something there!" I ordered a glider that day. An orange and white beauty called a "Spitfire" (appropriate because I chewed tobacco in those days) for just over $400.00, from Chuck's Glider Supplies in Cleveland. Soon I was flying from the mountain and landing in Wackertown, or as we called it, Andrew's Air Force Base and the locals named us the Skywackers. The site became very popular, bringing pilots from as far away as West Va., Penn. and Ohio every weekend, and most of them would stay at my house. It didn't matter if it was flyable or not, they'd come anyway. One North Carolina pilot, Don Riley, was more enthusiastic than most. Whenever he would have a good flight, or whenever he felt like it, he'd let out a blood curdling scream that sounded something like BOOOOOWAAAAA!! This quickly became the "Call of the Skywacker", and I've tried to spread it from that day forward. I asked him once where this strange sound originated. " Well, back when I was barely old enough to drive I was chauffeuring my buddy and his girl friend around while they were in the back seat doing you know what! When all of a sudden he let out this shriek of ecstasy that would blister paint. After we got the car out of the ditch, we tried to duplicate this yell and BoooWaaaa is what we came up with." Don and I have the unfortunate coincidence, of having both lost the ends of a little finger in accidents. One day we were sitting around on top of the mountain waiting for conditions to improve when an interested bystander kept asking one question after question. "How do you get in this club?" he asked. "Well, the first thing you gotta do is whack off your little pinkie!..Show him Randy," Don said, as we displayed our less than perfect tentacles. He became a little pale and walked off. I later told him that was just a requirement for President and Vice President and he has been a loyal Wacker for 19 years. 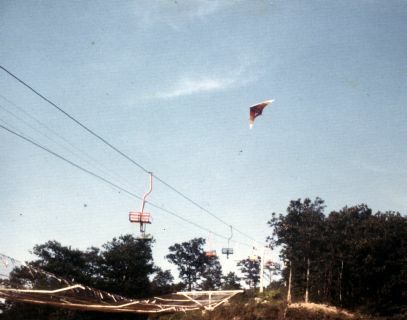 I was and still am obsessed with Hang Gliding. At that time I was just starting my own construction business but this new found sport was getting the most attention. We had sites facing every direction but southwest, so the name of my company was Southwest Construction. I only worked when the wind was southwest. On one of my very first cross country attempts, I went over the back. I just knew I'd gone at least 50 miles (more like 15) and landed in an old farmers field where he and some guys were working. I unhooked and wobbled up to them, still wearing my cocoon harness, helmet, facemask, gloves and goggles. "Where am I?" I asked. "EARTH!!!" he replied. I have since seen this in print but I swear it really happened. Really! Hang Gliding has taken me to some beautiful places that I probably wouldn't have seen otherwise. Besides the great sites I've flown on both coasts of the USA, I've traveled to Mexico, Guatemala, Russia, and Venezuela. In Mexico, Wayne Sayer and I flew from "The Rock of the Devil" and landed in "The Valley of the Brave". In Guatemala, Wayne, Paul Tidwell, and myself launched into a landscape of ancient lakes and volcanoes, to later descend out of the clouds to land by the pool at a tropical hotel. Where waiters in bow ties brought beer as we lounged around the pool. Venezuela was probably the best as far flying goes. Dennis and Claire Pagen, Wayne and I went from one end of the country to other flying every mountain that we could find a road to. We'd climb to the heavens in rowdy thermals to kiss the sky, only to later land and kiss the ground. I even came close to drowning near the famous Angel Falls. It was quite an adventure. But I guess my most memorable trip was the one to Russia, mainly because I ended up marrying the beautiful Russian interpreter. Fourteen of us went over on a Goodwill flying trip, but our gliders never made it. Dennis somehow managed to scrounge up ten old Russian gliders in Moscow and ship them to our flying site. (I found out USA does not have a lock on the duct tape market) We were treated like kings from the time we got there to the time we left. Kristina, one of the interpreters, came to the states a couple of summers later for a visit, and the rest is history. 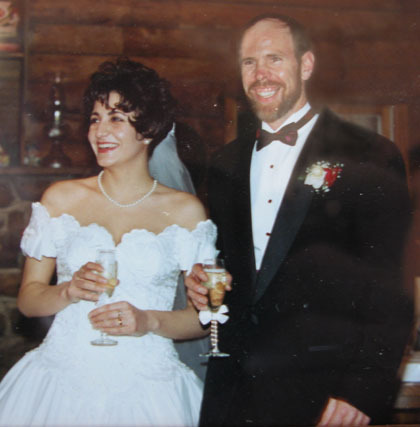 We got married Feb. 4, 1995 during a Blizzard, but Sky Wackers from all over came to beautiful downtown Bland anyway and BoooWaaaaaa-ed till the wee hours. The town is still talking about it. The marriage is going great. I eat great homecooked Russian food at every meal and the old house doesn't look the same. (Can't find anything, but that's the price) We do disagree a lot though. She likes one kind of curtain, I like another. She likes one kind of car, I like another, but the other day I told her, " I have better taste than you." She replied, "how do you get that?" I said, "Well, Look at what you married and look at what I married!!" I think that Hang Glider Pilots are the most privileged people on earth. One flight can be more excitement than most people will have in an entire lifetime. This sounds crazy but pilots know what I'm talking about. The best part is, chances are next weekend we can do it again. Even though the flying is great, some of the best moments in Hang Gliding happen after you land. In Venezuela, for example, we were literally mobbed by kids. It was scary at first, trying to work little patches of lift 200' over a cut cane patch, as a herd of brown faced, black haired kids circled in the field as I circled above. I prayed for "beeps" as the screaming youngsters ran from all sides to join the populace, only to find out later that this was one of the most memorable times of the whole trip. (Well, except for almost drowning or watching Claire and her broken glider descend under canopy toward brush fires and power lines) We had a lot of fun meeting all of the people and got to know many of them by name. That's what Hang Gliding is about. The people, be they pilots, landowners, drivers or just spectators. One of these days, I'll no longer be able to fly these things but I bet some of my old faithful flying buddies will be around to tell Hang Lies with. I wish I could name all my flying friends here but there's just too many. Thinking back to that day in 1976 sitting in the bed of that pickup truck, of the many other paths I could have taken with my life, I think I'm the luckiest man alive.